BEIJING (Bloomberg) -- Volkswagen Group, General Motors Co. and Toyota Motor Corp. benefited as China became the first country in which more than 20 million vehicles were sold in any given year. Total wholesale deliveries of cars, buses and trucks rose 14 percent to 21.98 million units last year and may exceed 24 million in 2014, the state-backed China Association of Automobile Manufacturers said today. Sales of passenger vehicles climbed 16 percent to 17.93 million and may increase 9 percent to 11 percent this year, it said. GM, which counts China as its biggest market, saw sales climb 11 percent to 3.1 million in the country last year. Though the carmaker outsold all foreign automakers in China for eight straight years, it may lose that lead when Volkswagen reports 2013 figures later this month. The German company surpassed its previous annual record by selling 2.9 million vehicles in the first 11 months. Ford Motor Co., which got a late start in China, benefited from the popularity of its Focus compact car, helping the company post the biggest growth among major foreign automakers. China deliveries surged 49 percent to 935,813 units, outselling Toyota on annual basis for the first time. Toyota fell to No. 6 among foreign automakers in China, though Japanese carmakers rebounded from the backlash of 2012, when a territorial dispute over a group of uninhabited islands led to violent protests that prompted Chinese consumers to shun Japanese-branded cars. Toyota's sales climbed 9 percent to a record 917,500 units in the country and forecast deliveries will climb to more than 1.1 million this year. Nissan Motor Corp. and Honda Motor Co. also sold a record number of vehicles after posting declines in 2012. By contrast, Chinese brands saw their combined market share at home shrink 1.6 percentage points to 40.3 percent, according to CAAM. Their exports dropped 8 percent, the first decline in five years, because of unstable overseas demand and insufficient competitiveness, the association said. Ford's Focus was the best-selling car last year, while Great Wall Motor Co.'s Haval topped SUV sales. In December, passenger-vehicle sales rose 21 percent to 1.7 million units. Ole Hui, a Hong Kong-based analyst with Mizuho Securities Asia, said last month's increase was faster than the 15 percent to 16 percent growth he had estimated. China, the world's biggest carbon emitter, is home to some of the world's most polluted cities, with smog levels that can surpass World Health Organization safety thresholds by almost 40 times. Outdoor air pollution was found to cause lung cancer and linked to an increased risk of bladder cancer, a WHO agency said last month, rating it as a carcinogen for the first time. 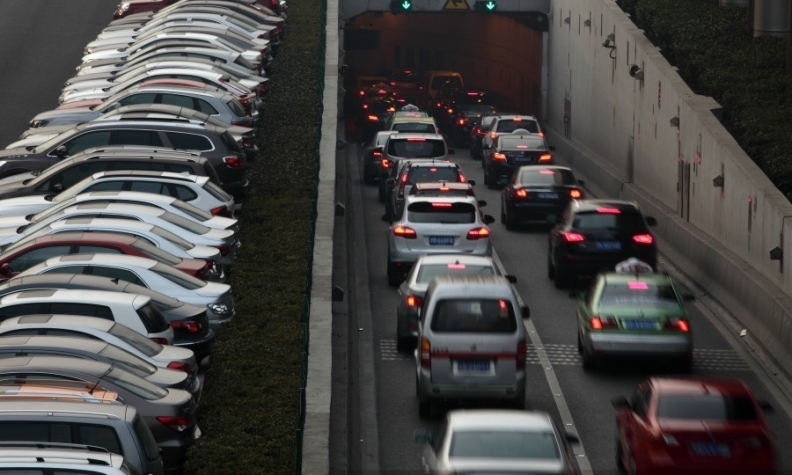 Shanghai, which is considering a congestion charge for motorists, last month experienced record levels of the lung-constricting smog that teary-eyed Beijing expatriates have come to call the "Airpocalpyse." In Xi'an, the former imperial capital, pollution soared to 38 times the WHO threshold. To combat air pollution, China's State Council, or cabinet, released a national plan in September that called for a 15 percent to 25 percent reduction in particulate matter by 2017 in the three key manufacturing regions anchored by Beijing, Shanghai and Guangzhou. Vehicle emissions now account for 20 percent of PM2.5 fine particulate matter that pose the greatest health risks because they can penetrate deep into the lungs, according to the official Xinhua News Agency.